If you’re looking for wedding stationery that has a unique and seductive design, the purple Carnaby collection from Little Angel Weddings could be perfect for you. A luxurious length of Cadbury’s purple satin ribbon that has been beautifully hand laced takes the centre stage in this range, capturing the beauty of your wedding dress perfectly with its classic and elegant bodice design. We think the Carnaby wedding stationery is brilliant because whilst it features a strikingly gorgeous feminine corset stitch, it still has man appeal because there are no dainty or ultra-delicate illustrations or embellishments – best of both worlds! When your guests receive their DL size (100x210mm) invitation, which attractively makes the most of this distinctive corset-style design, they’ll find all of your wedding details on a beautiful insert card that has been carefully hand-studded with diamantes for that extra ‘wow’ factor. 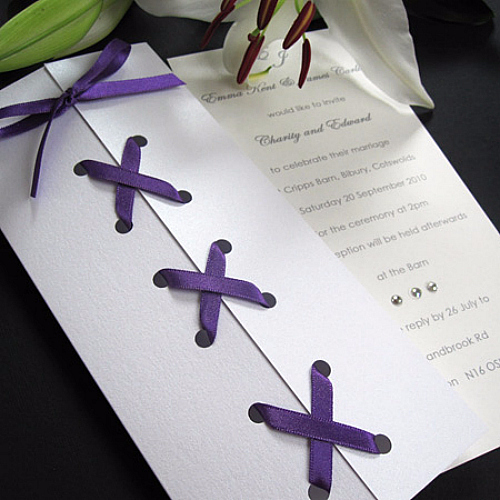 This unique design is perfect if you want to add a personal touch because you can choose from a range of matt or metallic colours (for the card and the satin ribbon) to suit your wedding theme. From day/evening invitations and RSVP cards to Order of the Day and blank or printed Place Cards, you can be sure that your wedding stationery will be organised in style. A sensual and somewhat gothic design, the Carnaby collection exudes confidence and romance, perfect to excite and tantalise your guests about your big day.